People all over the world use and rely on mobility vehicles, like electric wheelchairs, to improve their ability to freely move around. There are many types and models of mobility vehicles, which also include mobility scooters, so it is seldom difficult to find one that fits an individuals needs. For individuals who rely on their mobility vehicle everyday, it is likely necessary to find a way to transport the mobility vehicle. This way it is possible to use it at home and away from home. Many people use wheelchair lifts to make this task easier. There are several kinds of wheelchair lifts available. The external wheelchair lift is perhaps the easiest to install. These are mounted to an automobile’s hitch, so they can literally be installed or uninstalled in a matter of minutes. Most provide a lifting platform that can be raised and lowered electronically. In some cases a rechargeable battery pack is used to power the external wheelchair lift, but they can also be hooked to the automobile’s battery. The major advantage of an external wheelchair lift is the ease at which it is installed, which means it is typically not required to modify the automobile. Since the scooter or wheelchair is stored outside of the automobile, there is also no loss of space when using an external wheelchair lift. However, the scooter or wheelchair will be exposed to external elements, so some people opt to go with an internal wheelchair lift. Internal wheelchair lifts allow a wheelchair or mobility scooter to be stored instead of an automobile. Since the mobility vehicle is stored internally, it is protected from the elements, however, this comes at the loss of internal automobile space. For smaller automobiles, a crane lift is usually used. The crane lift physically hoists the wheelchair or scooter off of the ground, in a manner similar to how a crane operates. The arm either can be swung by the operator, or is controlled electronically. An electronically controlled arm, called powered rotation, makes it much easier to store the scooter or wheelchair. The crane lift is often used in the trunk of a car, which would not otherwise be able to use a platform wheelchair lift. Sometimes it is necessary to remove the handlebars when using a crane lift. The other type of internal vehicle wheelchair lift uses a platform design that is similar to external wheelchair lifts. The platform extends out from the vehicle and down to the ground, allowing the mobility scooter or wheelchair to be moved onto the lift. After the mobility vehicle is in place, the platform raises back into the automobile. This ensures that the mobility vehicle will not be exposed to external elements, however comes at the cost of internal automobile space. Often internal wheelchair lifts will be installed to the middle compartment of a van, although they are also used in the trunk area of SUVs and Vans. 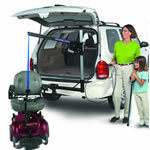 Using a wheelchair lift makes it much easier to transport a mobility vehicle. The type of vehicle will greatly determine what options are available, but there will still be several models to choose from.